Ribena Blended. Kah Mun ordered a cup of RM8.00 worth of Ribena Blended. 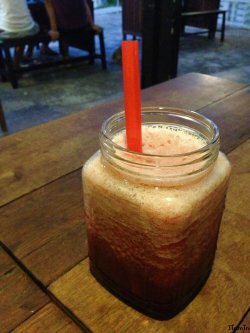 It tasted like overpriced, sweetened Ribena, to be honest, but it sort of saved my life after I finished my cup of drink, just because I was too thirsty and I was too bloated to order another cup of drink. 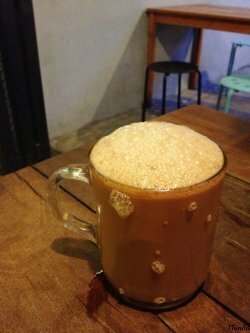 Teh Tarik. This was mine. Personally, I thought it was a good cup of Teh Tarik, although I repeatedly became thirsty after a few minutes. It wasn’t too sweet, and it wasn’t anywhere close to tasteless either. Triple H. Four of us ordered this sandwich and shared. Yes, it was a sandwich wrapped with a piece of fried egg, and it was filled with chicken meat. It may sound very ordinary and easy to be made. Still, I thought it was worth the price for its uniqueness. Or maybe not. 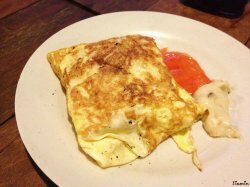 The fragrance of the egg was really good, to the extent that we couldn’t help but to finish it before our own spaghetti were even ready to be served. Carbonara Chicken Turkey Ham Spaghetti. This was my spaghetti, cooked together with classic bacon and egg with turkey ham in a super creamy sauce. Certainly, you can always choose between turkey ham, meatballs, or smoked duck. Compare it with the cup of Teh Tarik and imagine the size of the spaghetti! One thing to be mentioned though, was their funny services. 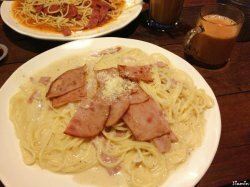 Rou Han ordered Olive Garlic Pasta with Beef, whereas my order was Carbonara Chicken Turkey Ham Spaghetti. The waiter actually reconfirmed our order prior to placing it at the counter. 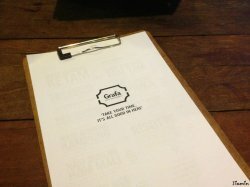 Yet, when the food was served, they got confused. They served me with beef and they served Rou Han with turkey ham. Hm.